a bacterial species that is the chief causative agent of gas gangrene in humans and a cause of gas gangrene in other animals, especially sheep; it may also be involved in causing enteritis, appendicitis, and puerperal fever; it is one of the most common causes of food poisoning in the U. S. This organism is found in soil, water, milk, dust, sewage, and the intestinal tract of humans and other animals. A bacterium that can cause gas gangrene and food poisoning in humans and various diseases in livestock. a species of anaerobic gram-positive bacteria capable of causing gas gangrene and food poisoning in humans and various digestive and urinary tract diseases in livestock. The oval spores of the bacteria are found in the soil and in the intestinal tracts of humans and animals. It is the third most common form of food poisoning in the United States and the United Kingdom. Incubation time is 6 to 24 hours, usually 10-12 hours. Symptoms include abdominal cramps and diarrhea. Vomiting is rare. 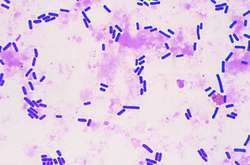 Also called Clostridium welchii. A bacterial species that causes gas gangrene; it also may be involved in causing enteritis, appendicitis, and puerperal fever. It is one of the most common causes of food poisoning in the U.S.
Synonym(s): gas bacillus, Welch bacillus. a genus of anaerobic spore-forming bacteria of the family Bacillaceae. Most are gram-positive rods. causes botulism from neurotoxin produced during vegetative growth. C. botulinum types B, C and D are associated with disease in animals but the type prevalence varies geographically. See botulism. involved in the spoilage of meat. may be associated with colitis X in horses. formerly called C. feseri. See blackleg. cause of ulcerative enteritis and liver necrosis in quail, turkeys, grouse, partridge and chickens. Not an accredited species. now called C. chauvoei (above). formerly called C. novyi type D. See bacillary hemoglobinuria. a species found in feces, soil and sometimes wound infections. An important cause of meat spoilage. a thermophilic spoiler of canned meat producing hydrogen sulfide gas and causing purple staining of the inside of the can. Now called Desulfotomaculum nigrificans. see infectious necrotic hepatitis. See also C. haemolyticum (above). Previously called C. oedematiens. Type A causes malignant edema in cattle and sheep, and big head in rams, type B causes infectious necrotic hepatitis (black disease), and type C has been associated with osteomyelitis in buffalo. a proteolytic subgroup of C. botulinum; not a valid species. cause of enterotoxemia. Type A causes malignant edema, type B causes dysentery in lambs and enterotoxemia, type C causes struck in sheep and necrotic enteritis in piglets, type D causes enterotoxemia and type E causes necrotic enteritis. Previously called C. welchii. causes deep bone taint in hams. See also C. putrificum (below). a cause of bone taint in cured hams. There is no detectable abnormality on the surface of the ham. formerly called C. septique. See malignant edema, braxy. cause of a small proportion of cases of gas gangrene in ruminants. See also abomasitis. associated with enteritis and enterocolitis in rabbits, guinea pigs and foals. an apathogenic clostridium often found in lesions of gas gangrene. a common inhabitant of soil and human and horse intestines, and the cause of tetanus in humans and domestic animals. found in fight abscesses and pleurisy in cats. 3] who developed a multiplex PCR assay for determination of the toxin genes of C.
Genomic structure and location of virulence genes in C.
Aggregation of platelets in the mesenteric microcirculation of the rat induced by alpha- toxin (phospholipase C) of C.
Highly conserved alpha-toxin sequences of avian isolates of C.
Polymerase chain reaction for differentiation of five toxin types of C.